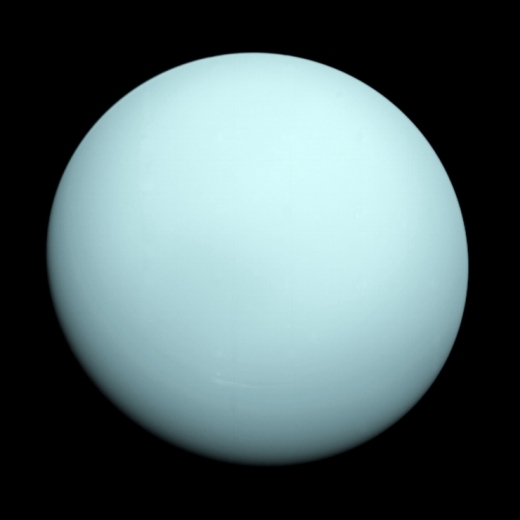 Perhaps the image of Uranus just below helps explain why the planet has been treated so sparsely in science fiction. Even this Voyager view shows us a featureless orb, and certainly in visible light the world has little to make it stand out other than its unusual axis of rotation, which is tilted so that its polar regions are where you would expect its equator to be. Geoff Landis’ “Into the Blue Abyss” (2001) is the best fictional treatment I know, but the fog-shrouded Uranus of Stanley G. Weinbaum’s “The Planet of Doubt” (1935) has its own charms, though obviously lacking the scientific verisimilitude of the Landis tale. My admiration for Gerald Nordley’s “Into the Miranda Rift” (1993) is unabated, taking us into this strange world’s most dramatic moon, while I should also mention Kim Stanley Robinson’s visit to Uranus in Blue Mars (1997), where the moon is established as a protected wilderness site while the rest of the Uranian satellite system is under colonization. Fritz Leiber’s “Snowbank Orbit” (1962) explores aero-braking at Uranus, while Larry Niven’s A World Out of Time (1976) maneuvers the planet to adjust the Earth’s own orbit. Image: The planet Uranus as seen by Voyager 2, which flew closely past the seventh planet in January of 1986. Credit: NASA/JPL. I will spare you the 1962 film Journey to the Seventh Planet and move on to new work on Uranus out of the Georgia Institute of Technology, where researchers have discovered that the magnetosphere of the planet ‘flips on and off like a light switch’ (according to this Georgia Tech news release) as it rotates along with the planet. In one orientation, the solar wind flows into the magnetosphere, which later closes to deflect that same wind away from Uranus. Compare this with the Earth, where the magnetic field is nearly aligned with the planet’s spin axis, which means that the magnetosphere spins along with the Earth’s rotation. Even so, disruptive events can occur because of geomagnetic storms. A strong solar storm disrupting the magnetic fields of the solar wind can reconfigure Earth’s field from closed to open, rearranging the local magnetic topology to allow a surge of solar energy to enter the system. Such reconnection happens throughout the Solar System, and occurs when the direction of the heliospheric magnetic field is opposite to a planet’s magnetospheric alignment. Geomagnetic storms produced by coronal mass ejections slamming into Earth’s magnetic field can produce spectacular aurora events while playing havoc with radio communications. Reconnection drives the entire process, happening in the presence of plasma, which carries its own magnetic fields in a constantly adjusting dance between charged particles and fields. Sudden changes in the alignment of the magnetic field lines convert the stored energy of the magnetic fields into heat and kinetic energy that drives particles along the field lines. Image: Magnetic reconnection (henceforth called “reconnection”) refers to the breaking and reconnecting of oppositely directed magnetic field lines in a plasma. 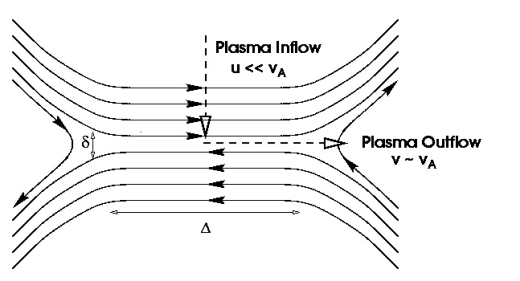 In the process, magnetic field energy is converted to plasma kinetic and thermal energy. Credit: Magnetic Reconnection Experiment. The paper is Cao and Paty, “Diurnal and seasonal variability of Uranus’s magnetosphere,” published online by the Journal of Geophysical Research: Space Physics 27 June 2017 (abstract). Uranus also has a magnetic field that is off-centered and tilted 60 degrees from its axis of rotation. IIRC, Neptune has a magnetic field almost as wonky as Uranus’s. Is there some reason Ice Giants would have such magnetic fields? It could be due to the higher ionic conductivity of their icy mantles than their cores which would most likely be very hot suppressing magnetic field generation. A NASA Science definition team has been looking at mission options to the Ice Giants. For Uranus, thus includes Flybys, done already by Voyager 2 , and a variety of increasingly comprehensive orbiters . The basic , 3 instrument 50 Kg payload comes in at $1.6 billion , with an extra $400 million adding in an atmospheric Probe. The most sophisticated 150 Kg payload includes a comprehensive 11 instruments ( including a magnetometer ) and comes in at up to $2.4 billion , but without an additional Probe. Launched by Atlas V or Delta IV Heavy gives transfer times of around ten years with a Jupiter Gravity assist ( possibly with Earth and Venus involved additionally ) with multiple launch Windows available between 2028 and 2032. ( Saturn also available ) The SLS plus or minus SEP staging can reduce transfer times by two- three years. As yet untried atmospheric aerobreaking can bring transfer down even more to as low as just 5 years. All on the Outer Planets Assessment Group ,OPAG , NASA site and well worth a read . Plenty of Neptune options too generally at an additional $300 million cost per option and transfer times varying from 13 years down to just 7 with aero breaking . Good to see NASA is considering some ice giant orbiters and atmospheric probes. I assume the ice giants being gas giants have magnetic fields for the same reasons as other larger gas giants like Jupiter and Saturn: Electric arcs caused by the coriolis deflection of liquid metallic hydrogen make the magnetic field. Pressure ionization is what happens when hydrogen is under great pressure. The hydrogen becomes a conductor of electricity like a metal. The electrons become more free like the conduction band of a metal. Fixed. Thanks for catching that, Jon, and always feel free to let me know such things. I appreciate it when readers catch such gaffes. Even by the mid-1960s, space reactor technology (including thermionic power conversion) was well advanced. As “Centauri Dreams” contributor Andrew J. LePage has documented (see: http://www.drewexmachina.com/2015/04/03/50-years-ago-today-the-first-nuclear-reactor-in-orbit/ ), the U.S. launched a nuclear reactor into Earth orbit in April 1965. The Snapshot mission involved the SNAP-10A reactor, which powered onboard instruments and a small cesium-fueled ion engine; more powerful reactors such as the SNAP-50 were under development to power space stations, lunar bases, and electrical propulsion spaceships for exploring the solar system (see: http://www.osti.gov/includes/opennet/includes/Understanding%20the%20Atom/Nuclear%20Reactors%20for%20Space%20Power.pdf and http://www.osti.gov/includes/opennet/includes/Understanding%20the%20Atom/SNAP%20Nuclear%20Space%20Reactors.pdf ). Based on some recent news out of the White House, it sounds as though we finally have an administration which is both pro-space AND pro-nuke. Promising! How many science fiction stories ever imagined a world where it rained diamonds – in the planet’s interior? Previous post: Planet 9? Planet 10? Planet X?